I was wrong. Turns out, I did learn to sail and what’s more I loved it. I married that boy and we’ve been sailing ever sense. Fairy tale? Not really. Just one of those life lessons that sometimes you don’t know what you don’t know. But more than simply moving outside my comfort zone, the whole experience gave me something I wasn’t really expecting. Sailing, more than anything else I’ve done as an adult, has expanded my “I can do this” belief beyond the set of things I had previously used to define my abilities and worth. It has built an “I want to try even if I struggle” mindset that wasn’t there before. It’s hard not to imagine how things might have been different if I’d been armed with that knowledge all along. This is why I am certain that when you sign your daughter up for sailing lessons or sailing camp, you are giving her so much more than a fun summer outside. The lessons learned on the water in a sailboat, no matter what your age, are transformative. When your daughter learns to sail she gains an ocean full of perspective and skills. Lifelines that will be ever in reach as she bravely navigates a world that wrongly and too often whispers pretty instead of smart, optimistic, capable, happy. My husband wanted to get his sailing certification because he had earned his sailing merit badge as a boy scout. That experience exposed him to the possibilities that sailing offers. I wish I’d had that opportunity as a young girl. I am encouraging you to give it to your daughters. 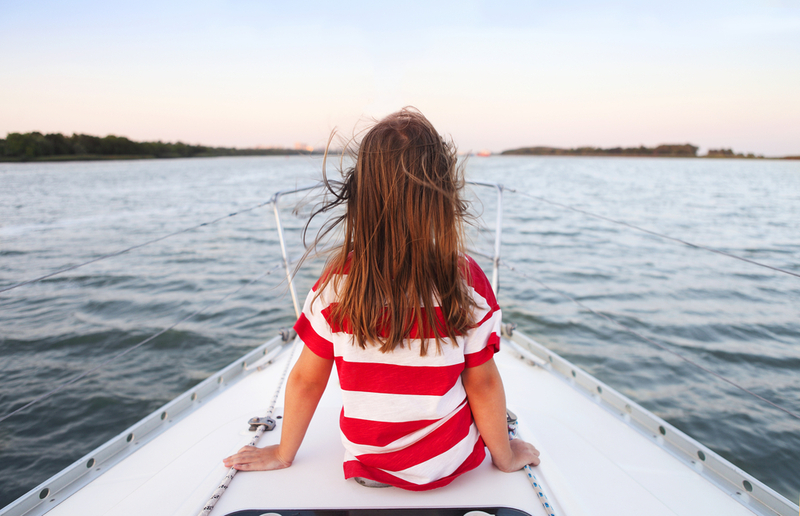 If your child sticks with sailing, she will eventually be on a larger boat with others and they will rotate roles. The captain provides direction and the crew understands and executes their respective jobs of putting up the sails, tacking, jibing, and maneuvering. Learning how to effectively communicate as a leader and how to be a good team member are residual lessons learned on the water that can’t be overstated. As much as working as a team is a critical component of sailing, sailing camp and sailing lessons crafted for children present opportunities for solo sailing. As with any new skill, getting it right may take some time. There will be a learning curve as new skills are layered on. But as these skills grow, your daughter will learn to sail and steer her own boat. Metaphorically this is huge and once again, confidence is at the core. The realization that through trial and error and with supported coaching you can learn something completely new builds a foundation of self-reliance. We don’t think about this word much, but its literal translation is the branch of applied mathematics dealing with motion and forces producing motion. Sailing is all about mechanics. With sailing, actions create instant reactions. How moving the tiller changes direction, how sail trim can improve or diminish performance, and as larger boats come into the picture, how the gears, winches, lines, and cleats work together provides critical hands-on lessons in “figuring out how things work”. Sometimes there just isn’t any wind, sometimes there is too much. Rain happens, things occasionally break, patience is often a necessity. Things don’t always go as planned. That is sailing and that is life. Learning coping skills to work through unexpected curve-balls and cultivating the ability to adapt and thrive regardless of the circumstances is possibly my favorite lesson. I am guessing the safety of your children is at the top of your list of things that are important, and perhaps the prospect of sending your child into a body of water may cause initial panic. Don’t let it. Your child will be in a life vest, or personal flotation device, the entire time. She will learn why awareness matters, she will learn water safety, she will learn what to do if she or someone else falls out of the boat. She will learn and appreciate the many safety lessons that are always part of sailing instruction so that she is well prepared and knowledgeable. Learning to sail is a sneaky classroom. You are out on the water and it is fun and exciting, so much so that it might not seem like learning. But at its core, sailing is chock full of math and science lessons. Observation of the weather, water, and wind behavior and the impact of these elements on performance is paramount to sailing. As your daughter’s sailing skills grow, anchoring and navigation calculations will enter the equation as well. Sailing offers hands-on learning with a purpose. Being on a boat helps improve balance because the motion of the boat requires it. That probably seems obvious and it is. Figuratively, though, a different kind of balance can also be achieved. Sailing allows your daughters to engage with nature, new friends, and a new experience in a way that offers a refreshing balance to a plugged-in world where the online perception of unattainable standards dominate and electronic contact steals hours from real engagement. The lesson of possibility is powerful. Where does your daughter want to sail? What parts of the world will she be able to explore? Will she sail in college? Will she take your family sailing one day? How can she use what she has learned to carve out her next step forward? Sailing offers a world of potential and possibility. And even if she only sails as a child at sailing camp, the many lessons learned won’t be soon lost. And of course, there is the confidence component. For girls of all ages, learning to sail is a classroom devoted to fostering self-confidence. The kind of confidence that comes with individual achievement and shared triumphs. The kind of confidence grounded in learning a skill she will have for life. The kind of confidence and life lessons that she can draw from to help her navigate life’s beautiful, bumpy waters.